Bring a large pot of lightly salted water to boil, add pasta shells, and cook for 8 to 10 minutes, or until al dente; drain. Heat olive oil in a large pot over medium heat. Saute mushrooms, green onions, and garlic until tender. 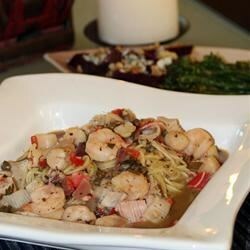 Stir in shrimp, scallops, and crabmeat. Cook for 5 minutes, or until shrimp is pink. Stir in wine, lemon juice, and butter; cook until heated through. Toss pasta with seafood sauce and parsley. See how Chef John turns fish and shrimp into sausage. Perfect. I made for my husband and mother and we were all crazy about it. Perfect Piccata sauce. FYI: Piccata sauce is supposed to be thin.